With this New radio there is not on/off switcher for the Airsoft on the Cannon Please press hold upper right hand-side button(Bullet Shooting), and then put the left hand side joy sticker up then it will shot the bb with this new 2.4ghz radio it build with BB shooting safe mode to avoid shot bullets by accident. 1/16 US M1A2 Abram Air Soft RC Battle Tank Smoke & Sound. This tank can move forward, accelerating speed forward, backward, accelerating speed backward, rotating, barrel can be raised 30 degree. Turret can turn 320 degree. With this New 2.4Ghz Radio System you can have up New 2.4GHz spectrum technology, with the functions of automatic identification and precise code pairing, strong anti-jamming, and allow more than 20 tanks to run at the same time. 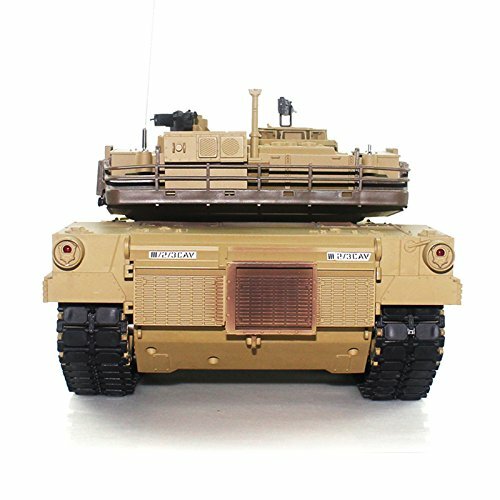 This is a 1/16 scale fully custom painted and assembled replica of the US M1A2 Abram Tank with the long gun barrel featuring radio-controlled of all movement including turret rotation and gun elevation. It features full suspension and a main gun that fires BB pellets up to 25 meters! Excellent value for money and a big improvement on the previous version. A great introduction to large scale radio controlled tanks. Maximum side turning angel of turret (left/right) approximately 320-degree Maximum vertical turning angel of gun (up/down) approximately 30-degree Maximum climbing gradient (changeable on different road surfaces) approximately 35-degree Product size: 56 x 23 x 18cm Function: forward high-speed forward, backward, high-speed backward and spin The barrel moves up and down 30. the turret turns 320 emulation music and action effect Full scale R/C function, supper chassis, Realistic suspension system Full scale R/C function simulative motor start-up sound Engine sound, machine-gun sound Cannonball sound Emulation action effect.